David was born and raised in Louisville, KY. It is the childhood memories, of watching his Father, an Engineer, on a drafting table that formed his love of structure and design. David graduated from Saint Xavier High School and then from the University of Louisville JB Speed School of Engineering. He completed multiple internships at General Electric, and worked part-time while at UofL. After graduating with a Bachelors of Engineering, David was hired onto GE’s prestigious Technical Leadership Program. David completed his Masters of Engineering in 2003 . David acquired many skills transferable in running a successful home building company through his 10-yr career at GE. In high school, David visited new custom homes in now, well-established Louisville neighborhoods. David’s oldest brother renovated homes before “flipping” was ever considered for a TV program. It was his summers in high school where David would help his Brother and fell in love with fine construction. David wants Stonecroft Homes to be a leader in providing clients one of a kind home plans, client experience, and a focus on delivering the Extraordinary! 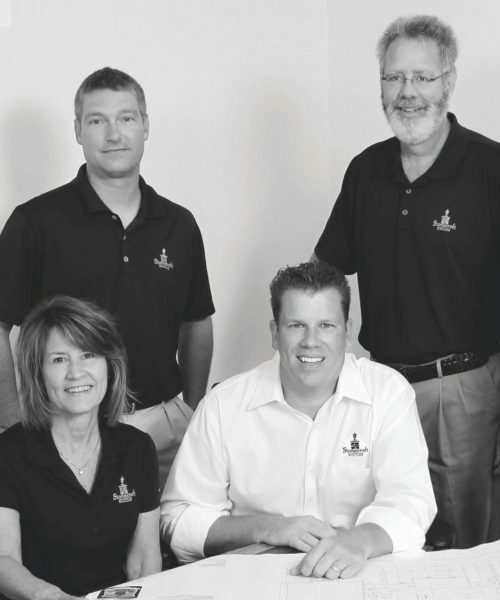 Brock joined Stonecroft Homes as a custom tile setter during their first Homearama in 2006 and remained perfecting his craft until 2011. At that point, he began assisting David on special projects such as the lead project manager for Waterscape, Stonecroft Homes 2015 Homearama Grand Award Winning Home. Drawing on his broad range of experience in the construction industry, Brock is a skilled project manager. His success is a direct result of his abilities as a problem solver, effective communicator with our trade partners, and a team builder. Brock earned his Eagle Scout and he and David met while at the University of Louisville’s JB Speed School of Engineering. He is a faithful Cards fan. Mark is a seasoned home plan designer bringing cross functional design experience that keeps Team Stonecroft blazing new trails in home design. A graduate from the University of Kentucky’s College of Design, Mark had lead commercial design projects around the globe. In 2000, Mark brought this expertise into residential design where he designed the Norton Commons original town center. Mark and David make a great duo in designing innovative floor-plans that are appealing to todays lifestyles and have the curb appeal Stonecroft Homes has become known for around the country . In his free time, Mark enjoys customizing cars and spending time with family and grand kids . Beth brings decades of experience from diverse accounting and operations roles to Team Stonecroft. A graduate from the University of Louisville, Beth was previously the Controller at both Stage One and Stemwood Industries, a manufacturer of high end furniture veneers in Southern Indiana. Beth’s integrity and passion for her role is a key ingredient to Stonecroft Homes continued success. Clients work with Beth relating to any project related costs during the process. She is thorough and committed to helping everyone move forward.